ZIMBABWE and Guinea Conakry yesterday signed four agreements covering the establishment of a Joint Commission, reciprocal exemption of visas to holders of diplomatic and service passports, agreement on cooperation and a Memorandum of Understanding for establishment of political and diplomatic consultation between ministries of foreign affairs. Guinea Conakry has decorated President Mnangagwa with the Grand Cross Award in honour of his visit, the first ever by a sitting Zimbabwean leader. Speaking soon after receiving the award yesterday before a dinner hosted for him by Guinea President Alpha Conde, President Mnangagwa said it was a symbol of everlasting friendship. “I am confident that the friendship and fraternal relationship will translate into strong economic ties through our bilateral relations as well as the various frameworks within the African Union and the United Nations,” said President Mnangagwa. The President, who ended his two day State visit last night, said the friendship must translate into strong economic ties. “lt is indeed a great honour to receive the Grand Cross Award on this occasion of my visit to the historic Pan African country of the Republic of Guinea. I receive this esteemed award on behalf of Government and the Republic of Zimbabwe and indeed on my own behalf, with great humility and pride. 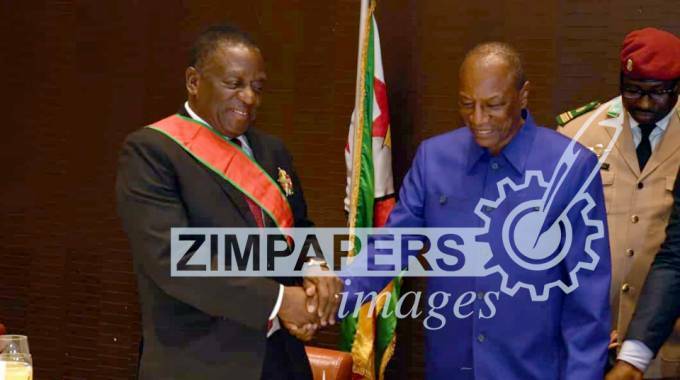 The Grand Cross Award is a symbol of everlasting friendship and solidarity that exists between our two countries which predates our independence,” said President Mnangagwa. “Your Excellency Cde President, this decoration (Grand Cross Award) is indeed a momentous occasion in relations of our two countries and of great value to me personally. May we continue in this spirit of brotherliness and togetherness as we journey towards uplifting the quality of life of our people and the economic prosperity of our two countries,” said President Mnangagwa. He said it was important to pursue the vision and ideology of Africa’s founding fathers, which sought to achieve unity, peace and development on the continent. President Mnangagwa arrived here on Monday at the invitation of President Conde. He used his visit to seek Guinea Conakry’s help in the removal of illegal western sanctions which are hurting the economy. Zimbabwe has been under the illegal western sanctions for nearly two decades. The sanctions were imposed as punishment on Zimbabwe for embarking on the land reform programme in 2000. What a load of old cobblers !! !